You know, I posted on my Facebook page that I thought I saw J.J. Evans the other day at the grocery store. 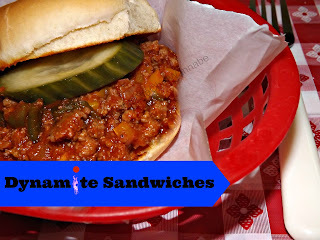 Ironically, I am now writing a post about a sandwich called a DYNAMITE! Or as J.J. would say, "dynOMITE". Am I dating myself? I used to watch Good Times everyday after school. It seemed so foreign to me, being a girl from small town rural America. I can remember thinking that one day I was going to visit a BIG city! HA! I had a reader request a recipe for a "Dynamite". I had no idea what it was, but I looked it up, looked around and did some reading. I found it, shared it with her and she said it was awesome. I was thrilled. I feared this might be a lot like a sloppy joe, which I loathe. It is, but it isn't. It is in the sense that is ground beef with a tomato based sauce. But it isn't your typical sloppy joe-ish kind of flavor it is SO MUCH BETTER! You might want to adjust the red pepper to your desired heat level. I can tell you with 1 1/2 tsp that I added made it PRETTTTTTY hot!! Go with what you think you will like, you can always add! This is a perfect recipe for a crowd, or game day parties or anytime!!! You can prepare this and put in your crock pot to simmer all day! I only let mine simmer 2 hours and it was amazeballs! In a large pot, brown hamburger. If you have a lot of grease in the bottom drain and return to pot, otherwise don't worry about it. When it is completely browned add in the bell peppers and onions. Saute and let cook with the hamburger for 5 minutes. Add in the rest of the ingredients and stir well. Turn to low and simmer at least 2 hours. You can put this in your crock pot and let it simmer up to 8 hours! The longer it simmers the better it is!